Foodtalk.org | Helping Georgians Eat Healthy & Get Moving! It is very important to handle foods properly in preparation for storage so that it’s harder for germs like bacteria and fungus to grow. Pick up cold foods last at the store and get them home quickly. This will help ensure the foods stay cold before you can get them to your fridge instead of warming up while you walk around the store. 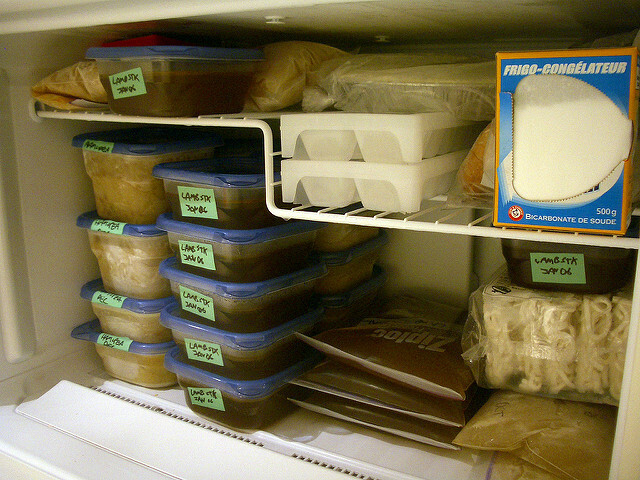 Immediately refrigerate or freeze cold foods. No one likes melted ice cream! Never leave potentially hazardous foods like meat, poultry, fish, eggs, dairy, cut fruits and vegetables, and cooked foods at room temperature for more than two hours. Potentially hazardous foods are more likely to carry germs than other foods. Always handle foods with clean hands and clean utensils in clean work areas. Cleanliness will help keep germs out of your food before they have a chance to grow. Package foods securely for storage. This will help prevent your food from being contaminated when you aren’t around to keep an eye on things.